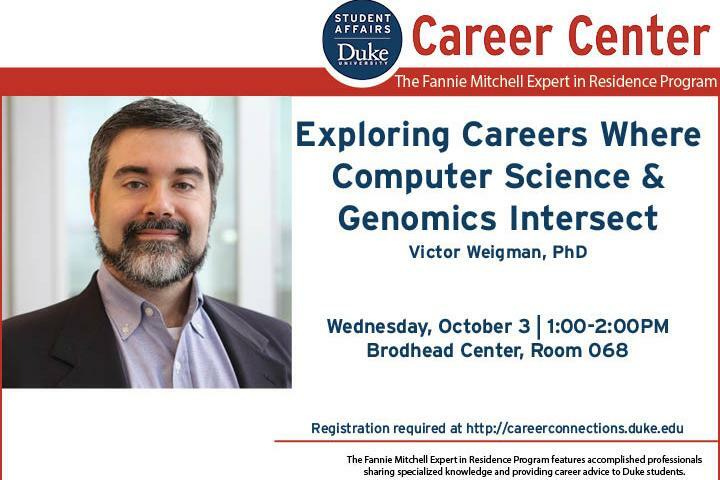 Join us and hear from Victor Weigman, PhD, as he talks about his PhD journey, research, and his role as Director of Translational Genomics at Q2 Solutions-a Quintiles-Quest Joint Venture. Weigman leads this group with a goal of continued facilitation of pre-clinical drug development through biomarker identification. Ongoing research revolves around the genomic profiling of cancer using both DNA and RNA approaches including the development and deployment of robust assays that can be leveraged clinically as laboratory developed tests. About Victor Weigman: Dr. Weigman brings more than 13 years of biomarker discovery research with genomics, with a majority of them dedicated to Expression Analysis (EA), a Q2 Solutions Company. This includes leadership of the Bioinformatics organization and software development to derive utility from Precision Medicine data. He has published papers on biomarker identification and assay development and has contributed to the development and launch of several genomic CLIA Assays and facilitation of genomics based Companion Diagnositcs. Dr. Weigman obtained his Ph.D. at the University of North Carolina in Biology and Bioinformatics within the Lineberger Comprehensive Cancer Center. *Registration required-click the More Event Information below to register for this event.